A membership bundle is a group of members who are linked together and managed by one of their members – the bundle administrator. 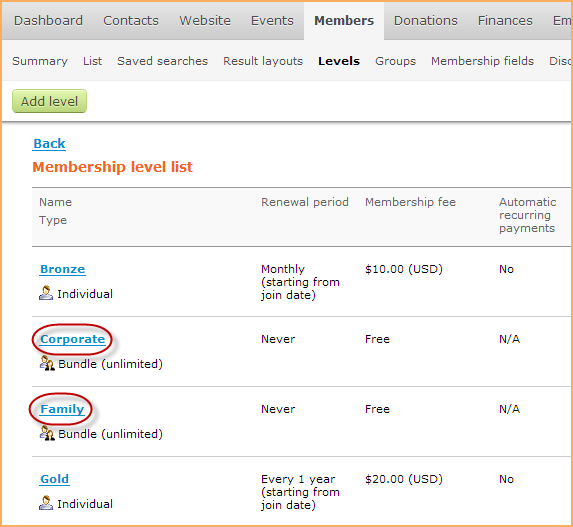 You can create membership bundles and add members to them via import. For instructions on creating membership bundles and adding members to them manually, see Membership bundles. 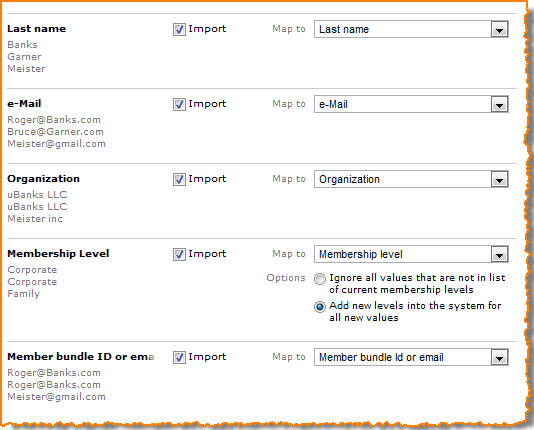 Through import, you can create multiple membership bundles using one or more bundle membership levels. To create a new membership bundle, set the Membership level field of the contact you want to be a bundle administrator to the appropriate bundle level. For each contact to which you assign a bundle membership level, a separate membership bundle will be created. The contact assigned to the bundle membership level automatically becomes the bundle administrator. In our example above, Roger Waterson is assigned to the Corporate bundle membership and so becomes the bundle administrator for a new Corporate bundle. Similarly, Karen Taylor, Maggie May, Kim Jones, and Lyle Carter will all become bundle administrators of their own respective bundles. 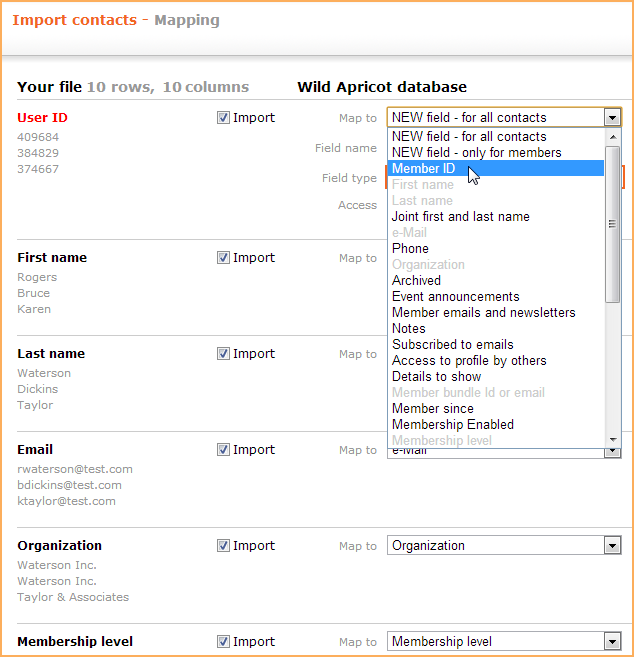 If the contact you want to be a bundle administrator is already in your Wild Apricot contact database, you can specify either an email address or the user ID (in column named or mapped to Member bundle ID or email). If the contact is new to your contact database, you must specify an email address. To add or update a bundle member through import, set the Member Bundle ID or email field for the member to be imported to the email or user ID of the bundle administrator for the appropriate bundle. In the above example, Bruce Dickins is added to the bundle administered by Roger Waterson using Roger's user ID, while Susan Boyer is added to the bundle administered by Karen Taylor using Karen's email address. For bundle members, the following fields can be left empty since they will automatically be matched to that of the bundle administrator: membership level, status, renewal due. If the Member bundle ID or email field is left empty, the import will not change any bundle details for the contact. Once you've prepared the spreadsheet with your bundle members, you can upload the import file to your Wild Apricot account. 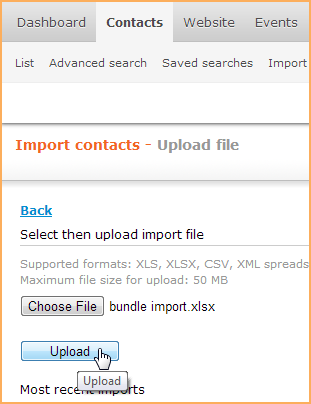 Hover over the Contacts menu and select the Import option. Select the import file on your computer or network then click the Open button. The file must be in either .xls, .xlsx, .csv, or .xml format, and up to 50 megabytes in size. Wild Apricot will now upload and analyze the import file. So that Wild Apricot can process the file properly, you will be prompted to provide some information about the import file. For details, see Importing members and other contacts. After you have reviewed and adjusted the import file settings, click the Next button to continue. At this stage in the import process, you map (i.e. link) columns in your spreadsheet to fields in your Wild Apricot database. If the field names in your Excel file match the field names in Wild Apricot, the system will automatically map the respective fields. If not, you can select the fields in your Wild Apricot contact database into which the values for each column will be copied. If you want to create a new bundle membership level using values you entered in the spreadsheet in the Membership level column, click the Add new level into system for new values option beside the Membership level entry. This will create a new membership level if the level name in the import file doesn't already exist in the system. It is usually a good idea to first create all the membership levels you need in Wild Apricot before beginning your import, instead of creating them during import. This will prevent additional unwanted levels from being created if you make spelling mistakes in your spreadsheet. Once you have completed the import, you can hover over the Members menu and select the Levels option to view the new bundle levels that were created. By default, any new bundle levels created via import are automatically set to Free and Unlimited. You can modify them at any time to be limited and paid. Import 1: Suspend all bundle members (by setting their Membership enabled fields to No). Import 2: Suspend the bundle administrator at which point the entire bundle will be suspended. The bundle can be reactivated by importing the bundle administrator and bundle members with Membership enabled field set to Yes. This will reactivate all bundle members and the bundle administrator.